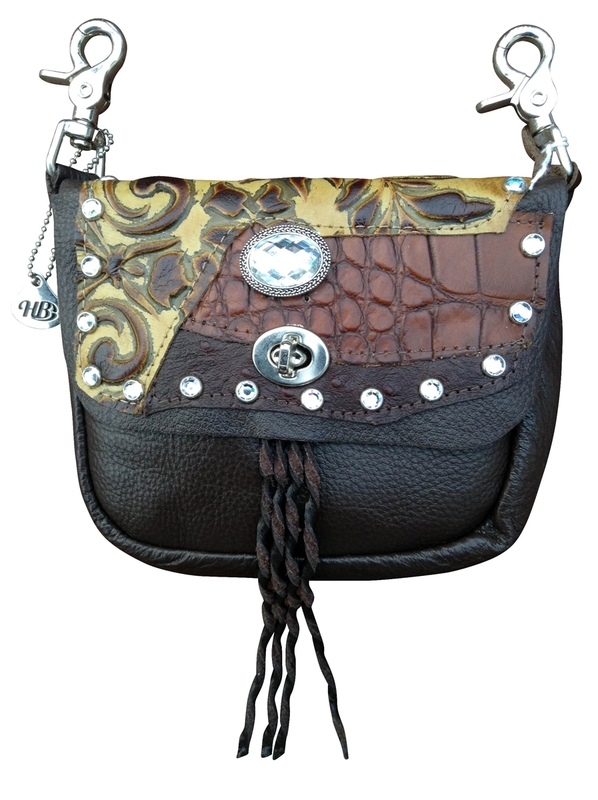 This classy little beauty is one-of-a-kind, as are all bags from the Hip Bag Company. All are handmade, and no two are ever exactly alike. All hip bags are made of reclaimed and repurposed leather that's been recycled and repurposed from vintage jewelry, exotic leather remnants and top quality scrap leather from some of the finest leather manufacturers in the U.S. to produce stunning works of art that you wear on your hip! This rich chocolate brown cowhide bag is soft and supple (the photo looks black but it is brown). The front flap has printed leather and a touch of genuine ostrich. The jewel-like beveled centerpiece reflects sparkles, and twisted brown suede laces stream down below. Crystal studs outline the flap. Quick. . .get it now. There is only one and the first one who puts it in their shopping cart gets it.